Anthrax Outbreak In Russia Thought To Be Result Of Thawing Permafrost : Goats and Soda Russia is experiencing its first anthrax outbreak in more than 70 years. One child died. Health officials think it might have been triggered by warming permafrost, which unleashed dormant bacteria. 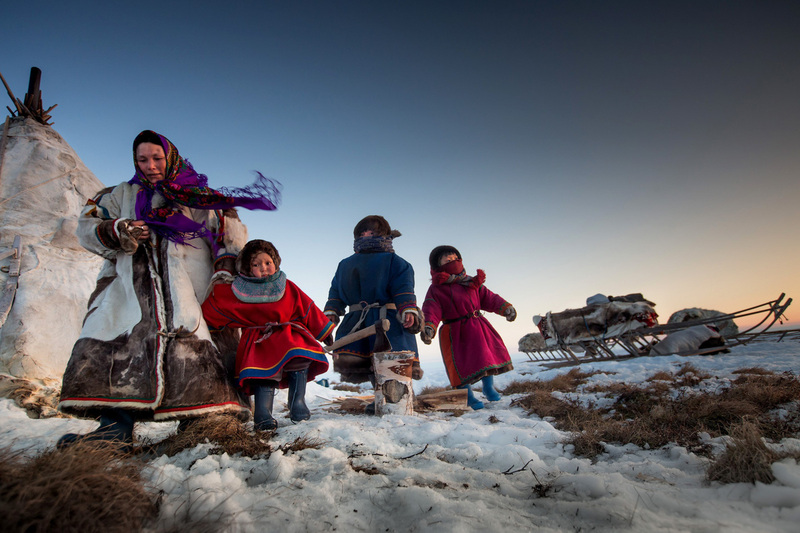 A family near the Siberian city of Salekhard. A heat wave is blamed for thawing a 75-year-old reindeer carcass, along with dormant spores of anthrax bacteria that infected it. Russia is fighting a mysterious anthrax outbreak in a remote corner of Siberia. Dozens of people have been hospitalized; one child has died. The government airlifted some families out because more than 2,000 reindeer have been infected. Officials don't know exactly how the outbreak started, but the current hypothesis is almost unbelievable: A heat wave has thawed the frozen soil there and with it, a reindeer carcass infected with anthrax decades ago. Some scientists think this incident could be an example of what climate change may increasingly surface in the tundra. The place where the outbreak is occurring is called the Yamal Peninsula. It lies high above the Arctic Circle at the top of the world. It's so cold there, the soil — called permafrost — is frozen solid, more than 1,000 feet deep in some places, or about the height of the Empire State Building. "The soil in the Yamal Pennisula is like a giant freezer," says Jean-Michel Claverie at the National Center for Scientific Research in France. "Those are very, very good conditions for bacteria to remain alive for a very long time." In this case, the bacteria were anthrax, and more than 75 years ago, they killed a reindeer. The carcass got covered in a thin layer of permafrost, Russian officials think. For decades, it lay there frozen. Then this summer, a heat wave hit and a thicker layer of permafrost melted, and the reindeer's carcass rose to the surface, the theory goes. As it warmed up, so did the anthrax. Infectious spores spread across the tundra. Reindeer grazing nearby picked up the disease. Russian officials say they're working hard to get the outbreak under control. They're vaccinating reindeer and burning the carcasses of dead animals. There's likely to be more cases of anthrax resurfacing, says Birgitta Evengard, a microbiologist at Umea University in Sweden. That's because climate change is causing the temperature in the Arctic Circle to rise very quickly. "It's rising about three times faster in the Arctic than in the rest of the world," she says. "And that means the ice is melting and the permafrost is thawing." In the early 20th century, there were repeated anthrax outbreaks in Siberia. More than a million reindeer died. Now there are about 7,000 burial grounds with infected carcasses scattered across northern Russia. "It's not that easy to dig in the permafrost to bury these animals," Evengard says. "So they are kind of very close to the surface." That means anthrax outbreaks in Siberia could occur every summer, she says. And it's not just anthrax that could be a problem. People and animals have been buried in permafrost for centuries. There could be bodies infected with all kinds of viruses and bacteria, frozen in time. She says scientists are just starting look for it. "So we really don't know what's buried up there," she says. "This is Pandora's box." For example, researchers have found pieces of the 1918 Spanish flu virus in corpses buried in mass graves in Alaska's tundra. There's also likely smallpox and the bubonic plague buried in Siberia. So the question for researchers is: Could these pathogens — like anthrax — ever be reactivated?